Update 5/23/2014: This post should now be unnecessary and no longer accurate as of the May 2014 Adobe Analytics release. See this post by Ben Gaines for details on the segmentation feature updates released then. Update 3/27/2014: Following the Sneaks session at the 2014 Adobe Summit in Salt Lake City, this post is going to have a very short half-life. Segments are getting much more shareable! I’ll get this updated once I’ve got my hands on the update and can speak to it accurately. In honor of Adobe Summit 2014 coming up next week, I’ve got an Adobe-related tactical post! This system of sharing segments is rather annoying. Their should be an easier way for non-admin SiteCat users to share a segment. This can sometimes cause a good deal of pain. When I left my last company, one of the clients deleted my user account, which is understandable. What wasn’t good, is that we had a very long monthly report which made extensive use of segments built within that account (being on the agency side none of us had admin privileges or Discover). So after I left I got an email from a harried former co-worker trying to update the report, but couldn’t because the segments were all gone. Fortunately I had documented some of it, which helped, but it was a big work effort to recreate them for the new person. It would have been nice if I could have simply ‘pushed’ them to another non-admin user. BTW, the link to the google doc seems broken. Great post Tim. I’d love to see a part 2 that digs into the restrictions of how/where you can save segments. For example I can’t save certain segments to Data Warehouse because of evars or events used – which becomes problematic when I want to schedule files via Genesis integrations or Data Warehouse. Don’t hold your breath on a part 2 like that coming any time soon! It seems like, when it happens…I can usually figure out why, but it would take a lot of trial and error to actually reverse-engineer a finite ruleset. Interestingly, while I was at eMetrics this week and discussing this with someone from Adobe, he brought up that this gets even messier when you add Audience Manager and Insight to the mix. But, he also indicated that there are some new things coming that, while not designed explicitly to address this (because they’re larger scale), should be moving things in a direction that, ultimately helps. We’ll see what sorts of things get announced next week and whether we can infer the ramifications of those announcements on the world of segments! Useful article Tim and handy reference table. I agree with the other comment in that Adobe should make it easier to share segments between users. I am not an admin but a power user. Other users would benefit from my segments but other than sending screen shots I can’t share. Perhaps there needs to be Groups that users belong to and they can share amongst the group and between different Adobe tools. That’s actually coming *very* soon. Within the next few weeks, as I understand it, you (as a non-admin) will be able to share segments with specific users. There will *also* be groups that admins can share segments with. Adobe’s working hard to both make segments more shareable *and* to keep the list of segments shown for any user more manageable. In the interim, if you create your segments in Ad Hoc Analysis, you can put them in a Shared Folder and all users in SiteCatalyst will be able to see/use them. They won’t be available in Data Warehouse, but that may not be a constraint. A bit late but thanks for doing the legwork and putting this table together. Was always baffled at the complexity of this topic and had a bit of an understanding on the various scenarios but this definitely helped expand and clarify my understanding! 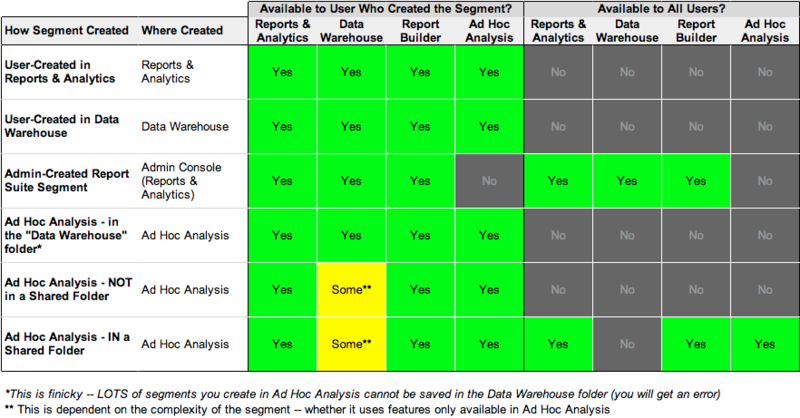 I was wondering whether it is possible to apply multiple segments at one time within Data Warehouse. Currently I couple segments together – for example Direct Traffic and traffic to a certain section of the website – and I am trying to avoid having to create many additional combined segments.